Youth and other activists from some twenty civic groups have joined five villages in their struggle against a planned ‘aerotropolis’ on Jeju Island, South Korea. Still waiting for a statement from the national government’s Ministry of Land and Transportation, residents of South Korea’s largest island continue their fight against the proposed second airport project. The project would push hundreds of locals off of their land and have the more drastic effect of radically transforming the island, environmentally and socio-economically. Many involved in the struggle expressed fear that last week’s compromise met by the opposition committee and local government won’t be backed by the national authorities. This compromise would grant a reevaluation of the initial area assessment. A number of candlelight vigils and other actions are ongoing. Saturday’s vigil marked the fortieth day of Kim Young-bae’s hunger strike. Kim is the vice-chair of the 2nd airport opposition committee. This means the villages have effectively bought time for a land and environmental impact assessment. Existing evaluations came under heavy criticism from many, including the some 15 environmental groups who joined the villagers’ action. Initial studies were carried out unbeknownst to village leaders. At no point before official declaration of the new airport project were residents consulted. Most residents found out about the project when it was announced in local newspapers. 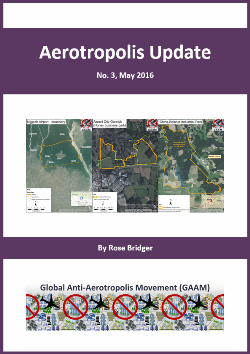 ‘Aerotropolis’ projects are notorious around the globe for corruption and often get slated for areas where residents can mount little effective resistance.